Welp, time to show what I doodled for the Steven Bomb 2.0 during my work breaks. 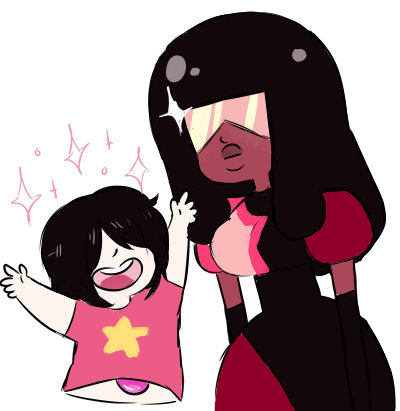 Doodle #1 inspired after watching “Sworn to the Sword”, Garnet and Steven are the comedy duo! Doodle #2 inspired by “Rising Tides/Crashing Skies”, the only important part of the episode: Steven riding Square Mom’s afro! Now it’s official she enjoys when he does that. Doodle #3 inspired by “Keeping it Together”, the Garnet feels killed me! I wanted to draw her crying. I’m trash. And doodle #4 chibi Crystal Gem pile from “Chille Tid”. Eventually there's gonna be a SU fanart featuring this FOB song. I'm jumpin' the bandwagon. Garnet’s the strongest gem. Don’t forget it. Uh, how long did you live here? For awhile, I guess, um, at least until I met your mom and the others. Finally, an excuse to draw Ghibli tears. Tina was just talking about one of the admirals in One Piece. And their backstory. Often characters in cartoons are short only when they’re a specific age (=either a kid or an old person) or when they’re from a ~race of magical creatures~ (like elves, dwarves, oompaloomphas, etc). I’m so happy to see a character who’s just short for the sake of being short. I feel as if most people here can relate to amethyst because of her personality & behavior, and her height adds something else that I can relate to. Highfive.